1) The passion for innovation. Innovation, which the Church has always eschewed, has become the very foundation of conciliarism. Indeed, Joseph Ratzinger/Benedict XVI has praised novelty and innovation repeatedly, doing so during his now infamous December 22, 2005, Christmas address to his conciliar curia. Since when has this been the case in the history of the Catholic Church? It is standard practice in the counterfeit church of conciliarism. 2) "They wish the scholastic philosophy to be relegated to the history of philosophy and to be classed among absolute systems, and the young men to be taught modern philosophy which alone is true and suited to the times in which we live." This is a cogent summary of the belief of Joseph Ratzinger/Benedict XVI himself, which he outlined in Principles of Catholic Theology and in his own autobiography, Milestones. 5) "They cry out that ecclesiastical government requires to be reformed in all its branches, but especially in its disciplinary and dogmatic departments They insist that both outwardly and inwardly it must be brought into harmony with the modern conscience which now wholly tends towards democracy; a share in ecclesiastical government should therefore be given to the lower ranks of the clergy and even to the laity and authority which is too much concentrated should be decentralized The Roman Congregations and especially the index and the Holy Office, must be likewise modified." The conciliarists have summarized Pope Saint Pius X's description of their Modernist view of Church governance very succinctly: Collegiality. It is no accident that Giovanni Montini/Paul VI gave away the Papal Tiara, which is on display in the crypt of the Basilica of the National Shrine of the Immaculate Conception in Washington, D.C., and that Albino Luciani/John Paul I and Karol Wojtyla/John Paul II and Joseph Ratzinger/Benedict XVI each refused to be crowned. This was quite symbolic, perhaps in ways that they did not even intend to signify as I have come to realize in the last three and one-half years. Joseph Ratzinger/Benedict XVI has gone so far as to remove the tiara from his coat-of-arms, which is reflective of episcopal collegiality with his own bishops and a gesture in the direction of those steeped in the heresies of Photius, the Orthodox. Pope Saint Pius X condemned as "absolutely false" the thesis that the State must be separated from the Church. Absolutely false. Joseph Ratzinger/Benedict XVI accepts as true and good that which a canonized pope, repeating the consistent teaching of the Catholic Church, which no one has any authority to contradict, condemned as absolutely false. Are you beginning to see, possibly, that there is a problem with the conciliarism in its entirety? Are you beginning to see, possibly, that there is no reconciling the unprecedented novelties of conciliarism and conciliarists, including one of the chief conciliarists, Joseph Ratzinger/Benedict XVI, with the consistent teaching of the Catholic Church? This paragraph is a ringing condemnation of the work of conciliarism and of its progenitors, the so-called "new theologians" (Henri de Lubac, Hans Urs von Balthasar, Karl Rahner, Joseph Ratzinger, et al.). Look at how Pope Saint Pius X zeroed in on the three things that Joseph Ratzinger spent nearly 400 pages trying to deconstruct and explain away in Principles of Catholic Theology: (1) The Scholastic Method of Philosophy; (2) The Authority and Tradition of the Fathers; and (3) the Magisterium of the Church The then "Cardinal" Ratzinger had to rely upon his Hegelian view of the world to explain away dogmatic pronouncements and articles contained in the Deposit of Faith that constituted part of the Church's Ordinary Magisterium. The Syllabus of Errors? Well, right for its time perhaps, Ratzinger and other conciliarists say, but we can see now that it was a "hasty" and "superficial" overreaction to events of the day. As Pope Saint Pius X noted; "They exercise all their ingenuity in an effort to weaken the force and falsify the character of tradition, so as to rob it of all of its weight and authority." This is so very important. Benedict's use of the word "tradition" does not mean what the Church has always taught it to mean. He desires to "weaken the force" and to "falsify the character of tradition" precisely so as to "rob it of all its weight and authority," considering the word "tradition" to be an empty vessel into which he can pour whatever meaning he believes is appropriate for "modern man." Is it any wonder that the conciliarists, to show their utter contempt for Pope Saint Pius X, erected a mural of Angelo Roncalli to the right of the altar under which rests the sarcophagus of Pope Saint Pius X? It was their way of saying to the eternal foe of Modernism, "We win! We spit on you!" As we know, their "victory" is only temporary. Our Lady will come to throw them out and to have them declared for what they have been and continue to be: enemies of the Catholic Faith who have been, whether wittingly or unwittingly, in league with the eternal enemy of God and thus of the welfare of the souls created in His image and likeness, the devil. There is no middle ground here at all. To take the views of Roncalli, Montini, Luciani, Wojtyla, Ratzinger and Bergoglio is to reject the Catholic Faith. Pope Leo XIII made it abundantly clear in Satis Cognitum, June 29, 1896, that a person who deviates from one part of the Faith falls from the Faith in its entirety. In other words, ladies and gentlemen, Pope Saint Pius X provided us with a road map as to how Modernists think and how they must "tear down the bastions" of the Church, including Scholastic Theology and the Authority and Tradition of the Fathers and the Magisterium of the Church, to attempt to convince Catholics that their innovations are perfectly in accord with the patrimony of the Catholic Church. Modernists must seek to make complex that which is simple in order to make it appear as though they, the "experts," have the key to unlocking the "truth" as they seek it out in "common" with Protestants and Jews, denying the Divine Constitution of the Catholic Church (that she has exclusive custody of and the ability to pronounce upon the Deposit of Faith) in the process. Joseph Ratzinger/Benedict XVI viewed Catholicity in a sense much different than the word Catholicism. "Catholicity," Ratzinger/Benedict wrote, is that sense of "openness" to the "movement" of the "spirit" in the midst of the larger "church," which includes Protestant "churches" and the Orthodox. Joseph Ratzinger/Benedict XVI and his successor as the head of the counterfeit church of conciliarism, Jorge Mario Bergoglio/Francis, believe that those who want to whack them over the head with the "time-bound" writings of Pope Saint Pius X, for example, do not have a broad understanding of the word "Catholicity" and are thus a threat to the "growth" of the "Church" in response to the promptings of the "spirit" as various "theses" and "propositions" clash with each other. The "two-headed 'pope' monster" and their fellow revolutionaries must resort to the very tactics described by Pope Saint Pius X in Pascendi Dominici Gregis to denounce those who adhere to the dogmatic pronouncements of the Church and the reiteration of the Church's consistent teaching by the popes of the Nineteenth and early Twentieth Centuries. Not exactly how the conciliar "popes" have spoken to the adherents of the Talmud as two of them--so far!-- have been treated as inferiors in Talmudic synagogues and as Talmudic choirs have sung about how the Talmudic Jews of today are "waiting for the Messiah," now is it? Oh, no. Pope Saint Pius X sought the conversion of souls, making no accommodations to the nonexistent legitimacy of false religions. JorgeMario Bergoglio/Francis was a regular visit of Talmudic synagogues in Argentina, and Joseph Ratzinger/Benedict XVI visited three of them, including one in Rome itself (see Saint Peter and Anti-Peter). The humble farm boy from Riese, Italy, who served in the cattle trading center of Tombolo, Italy, and used his gentle demeanor to extract from the men in that rough and tumble community a promise to refrain from cursing and using God's name in vain in exchange for his running a night school to teach them how to read and write, noted in his first encyclical letter, E Supremi, October 4, 1903, that he wanted to use gentleness in dealing with the problems of the day. 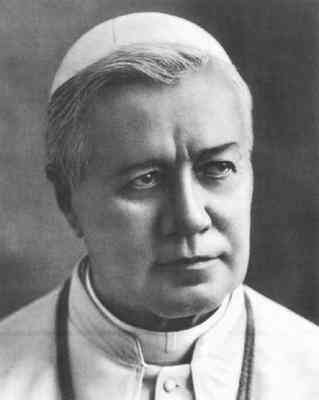 Faced with the obstinate boldness of the Modernists, however, Pope Saint Pius X, the pope of early First Communion and frequent Communions thereafter, the pope who loved children and wanted to see them instructed by means of the Catechism whose production he supervised, yes, this gentle pastor of souls, had to resort to the full force of the papacy to assess and to denounce the errors of Modernists and Modernism. Quite rightly did the sainted pontiff refer to Modernism as the "synthesis of all heresies:"
No, ladies and gentlemen, conciliarists such as Joseph Ratzinger/Benedict XVI know full well what it is they are doing. Ratzinger/Benedict XVI has read Pascendi and he rejects it. The fact that a man has a "Modernist" mind does not mean he is not responsible for the consequences of his Modernism. Such a line of reasoning is as novel as the novelties of the day, indicative of a complete and total and manifest unwillingness to deal with the simple fact that conciliarism is heretical and that a counterfeit religion has been created that has been a detriment to the sanctification and salvation of souls. A Modernist who knows what the Church pronounced at the twenty councils preceding the dawning of the age of conciliarism cannot be excused on the grounds that he is confused. Joseph Ratzinger/Benedict XVI knows what the Church has taught better than almost anyone else and he believes that his life mission has been precisely to use the methods described by Pope Saint Pius X in Pascendi Dominici Gregis (to reject Scholastic Philosophy, to attack the meaning of dogmatic truth and of Tradition and the teaching of the Magisterium) to create a "new synthesis of faith." He knows full well what he is doing, and what he is doing was condemned in no uncertain terms by Pope Saint Pius X. Faithful Catholics loved Saint Pius X during his eleven year pontificate. They knew him to be a good and generous pastor of souls, a pope who had a great and an earnest zeal for souls, and a deep, tender love for the young, taking the case of Little Nellie of Holy God to heart as the sign that he needed to give permission for the reception of First Holy Communion to children at a young age. Little Nellie died on Candlemas, February 2nd, 1908. As she lay dying, she saw something at the foot of her bed. Her eyes followed it, and she moved her lips as if she was speaking to someone. Then she smiled and passed away. Nellie was buried in the public cemetery, but a year afterwards her little body was removed to the Cemetery of the Good Shepherd Convent. The body was then found whole, except for the bone in the jaw which had been destroyed by disease. In regard to that decayed bone, it was declared that before she received her First Communion it gave off a terrible odor, but after that time the odor disappeared. Many pilgrims go to visit her grave every year. After Nellie’s death, the children of St. Finbar’s School made a special Novena that Little Nellie would obtain for them and all little children around the world, the great favour of receiving Holy Communion as near as possible to the age at which she received it. When Pope St. Pius X was told about Little Nellie, and how she longed for Jesus in Holy Communion, and how lovingly she received Him, he said, “There! That is the sign for which I have been waiting.” He also asked Little Nellie’s Bishop for a relic of her. We often wonder if your holiness has heard of our holy baby, ‘Nellie,’ who received Holy Communion at the age of four years and three months…. She received Holy Communion on December 6, 1907…. Holy God and Holy God’s Mother came for her February 2, 1908. Is this doesn't bring a tear to your eye and a smile to your Catholic face, good readers, nothing will do so. Pope Saint Pius X, who taught catechism when he was the Bishop of Mantua, Italy, and when he was the Cardinal Archbishop of Venice, Italy, and as the Supreme Pontiff, supervised, as noted above, a catechism that is still teaching Catholics to this very day. Faithful Catholics still love Saint Pius X. they know him to be the eternal foe of Modernism just as he is our eternal friend, especially in this days when a counterfeit religion that is the embodiment of Modernism has taken such hold over the minds and the hearts of so many Catholics. Faithful Catholics know that his devoted son of Our Lady and of her chaste spouse, Saint Joseph, whose very name he bore so admirably, is here to help us with his prayers and to teach us with his eternal words of wisdom that never--under any circumstances--lose their binding force.